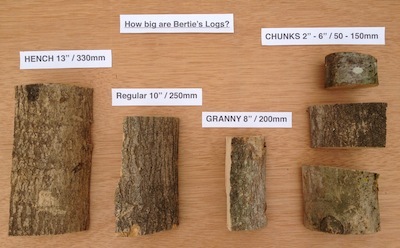 What size are Bertie's logs? Bertie’s logs are cut to an average length of 8", 10" or 13" and around 3" to 5" in diameter or cross sectional width for the larger split logs. However wood is a natural product and you might find a few logs that are a little bit larger or smaller in each batch. We call our small 8" logs 'GRANNY' logs and our large 13" logs 'HENCH' logs. We also produce log 'CHUNKS' that are a mixture of lengths from 2" to 6". Each product has the average log length clearly listed. How many logs are in a bulk bag? Bertie's half cubic metre bulk bags are loose filled and hold approximately 150 - 175 regular 10" logs. What's the difference between Kiln Dried Hardwood Logs and Kiln Dried Stove Logs? The only difference is in the species we use to produce the firewood. Bertie's Kiln Dried Stove Logs are produced from 100% Sweet Chestnut, a quality hardwood that can sometimes 'spit' a bit, so should only be used in a closed stove. If you have an open fire we recommend that you use our Kiln Dried Hardwood Logs. Can I come and pick some logs up? In our yard at Hadlow we operate a range of machinery that means we are unable to accommodate visitors due to safety reasons. However you can visit one of Bertie's local retailers to make your purchase. How should I store my Kiln Dried Firewood? Try and store the logs somewhere out of the weather. This can be inside or in a log store, but you can store logs outside if they are stacked and covered properly. To do this, stack the logs neatly against a sheltered wall or fence and then cover the top only. This will allow the logs to ‘breathe’ and any rain or moisture will quickly evaporate away. Does Bertie's deliver to my area? Please use the postcode checker to find out what delivery options you have in your area. How will my logs be delivered? Your firewood will be delivered by one of Bertie’s own trucks fitted with a crane. The logs will be delivered in a bulk bag and unloaded using the crane to your preferred position or as near as possible. Bertie’s trucks deliver Monday to Friday from 9am - 5pm. We cannot guarantee a delivery time as we need to plan our delivery routes to make sure they run as efficient as possible. Do I need to be in when the delivery is made? No, most of our deliveries are made without anyone being at home when we deliver. All you need to do is give us clear instructions where you would like the logs placed. Can you put the logs in my log store / shed / back garden? Our standard delivery includes offloading your bulk bag(s) of firewood using a crane. If you would like your logs neatly stacked in your log store / shed or anywhere else, there is an additional charge of £12 per bulk bag. What can I do with the empty Bulk Bags? At Bertie’s we like to reuse and recycle as much packaging as we can. When you receive your next firewood delivery please leave your empty bulk bag(s) out for collection. Can I change my order before it's delivered? If you would like to adjust quantities, add new items or remove items from your order, please go to "Your account" and "View / edit current orders". For addition help follow this walk-through... Modify My Order.